More precisely, it is and it isn’t. Karenia Brevis, the toxic alga that populates the spreading, lethal blooms we call “red tide,” is, in fact, a naturally-occurring organism. And yes, much smaller red tides have been documented since the arrival of Europeans on these shores. 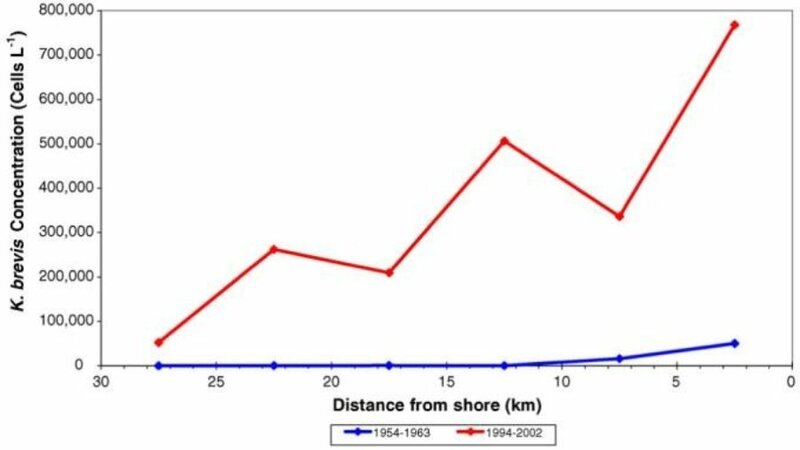 But there is a vast difference between the naturally-occurring red tides (see the blue line above), and the red tides we have been enduring for the last sixty years (the red line). There has been an 18-fold increase in K. brevis concentrations in the years between the two data sets, leading to today’s mega-blooms (Brand & Compton, 2007). Therefore, standing on solid scientific ground, I will state unequivocally that red tide as we know it today is not naturally occurring, and that to say otherwise is to do the public a profound disservice. Furthermore, unless something is done to halt the flows of manmade nutrient pollution, there is no indication that anything will change. The cause of today’s red tides is anthropogenic nutrient pollution (primarily nitrates and phosphates). It is not merely a marginal contributing factor or a variable, as certain institutions and elected officials would like us to believe. It is the cause. The seasonal timing of these mega-blooms has shifted over the last sixty years to actually match seasonal flows from polluted upland rivers down to the sea. There are three sources of nutrient pollution in nearshore coastal waters, where red tide blooms are strongest, according to Brand and Compton: Stormwater runoff, animal waste and fertilizers from farms, and phosphorus from the Bone Valley, which includes parts of Manatee, Hillsborough, Polk, and Hardee Counties. Stormwater runoff: Up until the 1950s and early 1960s, the Florida Gulf Coast was largely undeveloped, with 80-90% land coverage in vegetated tracts and parcels, which retained and absorbed rainfall, flooding and drying in natural cycles. Any stray nutrients were retained and absorbed in wetlands and upland habitats. Today, the coastline is virtually 100% developed with roads, rooftops and paved parking lots, all of which turn rainwater to “stormwater,” which is contaminated with nutrients. Animal Waste and fertilizers: Since the construction of the canal from Lake Okeechobee into the Caloosahatchee River (1937), the watershed of the Caloosahatchee has been increased by a factor of four, as the Kissimmee River basin and the lake now feed the Caloosahatchee. The Kissimmee/Caloosahatchee watershed is home to the most intensively-farmed counties in the state, which have been sending a torrent of nutrients downstream since Rick Scott and the Florida Legislature passed Senate Bill 552 in early 1996. SB 552 made as-yet-unwritten, unenforceable, voluntary best management practices the law of the land for municipal and agricultural sources, with predictable results. Phosphate: Immediately west of the Kissimmee watershed is the Bone Valley—source of much of the world’s phosphate fertilizer. Phosphate was mined out of pits on a modest scale until the Green Revolution of the 1950s and 1960s, when massive dredges and draglines were deployed on the Florida landscapes to strip-mine hundreds of square miles, leaving thousands of acres of nutrient-rich soils exposed to rainfall at any given moment. This material is carried to the sea by five rivers. Larry Brand, a PhD researcher with University of Miami, and his colleague Angela Compton, did a comprehensive research paper published 2007 in the scientific journal, Harmful Algae. They studied extensive data sets taken by the Florida Fish and Wildlife Research Institute from 1954 through 1963 and from 1994 through 2002. Their conclusions are stark. The 1954-1963 set can be viewed as historic, “naturally-occurring” red tide, which was neither a threat to tourism nor an apocalyptic killer of fish, but the 1994-2002 set—today’s conditions—is both.